Anyone got this work with the listed Arduino Sketch (code)? But I only get displayed the error message from the code : "communication Error 1 ". One of these individuals was kind enough to connect an arduino with the posted arduino test code to allow me to view what the samples looked like. Unfortunately it seems as if Sieg industries has completely changed their protocol! I am confident that I will be able to make updates to make the arduino code and my tachometer kits work but in order to do this I really need someone to probe the units with a logic analyzer and provide me with the dump of that. Do you happen to own one? While a significantly greater hassle, this should be possible to diagnose on an Arduino too with a sufficient number of samples. Currently I'm not sure if the size of each "frame" has increased in side and consequently led to me not seeing the whole picture. I would be happy to walk you through these processes if you are interested in helping. I do have someone else who is willing to help but they have other interests and I don't want to tie up all of their time figuring this out if they do not enjoy it. I don't have a logic analyzer, also I don't have the skill to work with one. I found your page and bought the stuff to get it run described here with a Arduino board. Do you think we have a chance to get it work in the near future ? 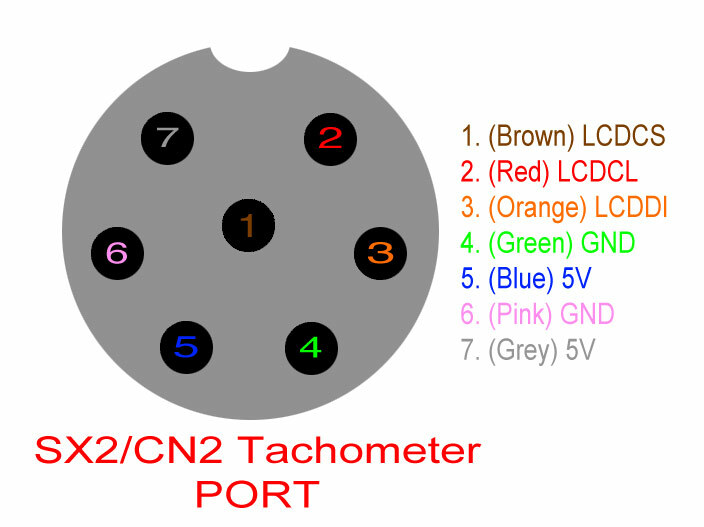 (otherwise I would consider try to find a other solution maybe with a tachometer with a hall sensor or light sensor or something like this. If you don't have a logic analyzer then I'm afraid we will have to wait until the UK individual receives his logic analyzer in the mail to solve this. I'm not sure when his analyzer will arrive but I will post back here once it has. O.K. I have got some news. I have connected it different to the shown picture, and now everything works well. Maybe this helps to other users who have had problems soldering the cables shown in the picture. I don't think this will help with the other individual's mills as they definitely show indications of a protocol change. They are also directly connecting into the speed adjuster board vs through that port. I have a SX2P and purchased a Sieg tacho for it. Well it didn't work - Think it just gave 000000 display so I returned it. If they have changed the protocol it seems Sieg has shot themselves in the foot then. Have you had any luck getting your kit working on a SX2P? Yes, my kit has worked with the newer protocols installed on these mills. That is quite a surprise that the official tachometer doesn't work with them. It makes me wonder if there is a problem with the wiring inside of your mill. first of all, thank for taking care to document everything about this tach. I have a mill bought in May 2015, and think I have got the one with the protocol change. I have wired up an arduino and I started with "communication error 1". I have then added some debug lines and I have noticed that the cycle usually get 69 bits and sometimes also 70. This obviously lead to the communication error. When the spindle is rotating, sometimes I get a "Communication error 2" but haven't still got some output from there. I'll do this this evening. I'm waiting to receive a SALEAE clone ( I know, I should have bought the original but being that I think I will use it just few times.... ) and as soosn as I can get it up and runinng I will take some snapshot for you. I have read on your news page about the change of protocolo, but do you mind to indicate the differences.please ? The newer mill firmware loads have an added 36 bit header to each packet. If you account for these bits the rest of the information is the same.